The NHS Administration would like to thank you for attending the Title I Parent Meeting. These meetings covered topics such as Title I, Graduation Requirements, Academic and Extra-Curricular opportunities for students, NHS Rules & Procedures, and resources available for parents. If you missed the meetings, we have attached the PowerPoint presentations that were presented during by our administration and counselors. 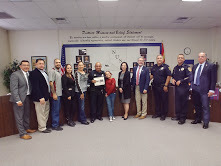 Congratulations to Officer Ray De La Ossa for being recognized at the 11/26/18 board meeting. We are very pround of our SRO!